Well, that's one way to learn alto clef. So here's to the beginning of a new series of blogs called, simply, "Emily in Violaland." Now, if you don't mind, I should probably go. Yay!!!! Welcome to violaland. Going back and forth is easy. Congratulations to you! And what a great piece to start your new chapter! Congratulations! Have fun in your new homeland. Yeah! 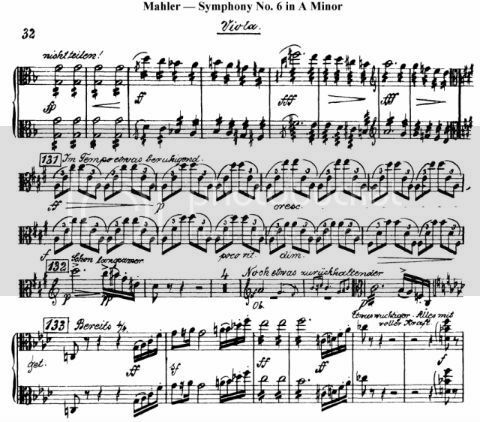 Watch your bow arm.... Mahler is a killer. To me the problem with going into violaland is not alto clef... it's treble clef! Then the violin mindset kicks in and AIAIAI! But that probably won't be a problem if you spend most of your time in violaland. At this point, I spend most of my time in violinland and only a few times a year go to violaland (I did live there for a couple of years...). It's good to be able to do both. Enjoy the dark side!